[Need Opinion] Idea: Laravel adminpanel-generator as a service? This article is a personal one from me and I really need your opinion on this idea. Would be grateful for any feedback in the comments, on Twitter or email povilas@laraveldaily.com. So, in short, does the market need QuickAdmin in SaaS version? Inspired by all the hype about new Laravel Spark and its success so far (or so it seems), I started thinking about SaaS possibilities myself. And it aligned with my old idea to make something bigger out of our package called QuickAdmin – at first we used it internally, then released as a Laravel package, and now it might be the time to build something bigger out of it. So the idea: what if you could generate adminpanel for your next project in the cloud? But if you want to DOWNLOAD the adminpanel for your own real usage – then you would have to pay for it. Not much, something like 9 USD or 19 USD. I imagine it as a full Laravel project downloadable as a zip file – and then you would have to just unzip it, run composer install and artisan migrate commands. In essence, that’s all. What do you think about this idea – would that be a viable business? As Spark saves you days/weeks of coding, so would QuickAdmin web-version. And before you ask – yes, I know there are adminpanel-packages already on the market, but they all seem a little outdated or semi-abandoned and slowly updated. And if we have that as a SERVICE for developers, I believe there’s a bright future. What do you think? Worth the time? Would you pay for it yourself? Want to ask you guys before starting coding anything – that’s a lesson I’ve learnt the hard way: too many times I was pursuing the idea as a shiny object before actually finding real customers for it. People who would actually pay. So in this case – changing the plan and going for the market research first. Looking forward to your help and opinions – thanks a lot! it’s a great idea. I would love to pay for download a package and then install it with a command mostly like spark. And I would love to pay $9 for it. Thanks for package, It is good package . I can create anything with it , It’s GUI version will be available in next month. It is much active in development . You have fine grain control over what you get (that’s why i like it). Why not you come together and create better version instead of creating new package. Hi Dhiraj, thank you for your comment and opinion. And nice package from InfyOmLabs, didn’t hear about it, will try it out. But you’re missing the whole point – I’m not suggesting another package, the idea is to have a SERVICE. That’s the biggest problems with all those packages – they are created, and then abandoned or not updated for newer Laravel versions. Because it doesn’t make money for creators, so it doesn’t make sense for them to put their time in it. That’s what I mean – in case of online-service, people would pay for new versions, for support, for help to use the adminpanel etc. Good projects updates very slowly because they don’t make money . So no one can work full time on open source projects. It is nice idea to pay for faster updates and bug fixes and to get new features frequently. It is nice idea of service. You can also sale it as package. I like your idea, and I think there would be plenty of people to pay. Thanks for the opinion and your questions raised on QuickAdmin GitHub, it’s all really helpful in clearing up the vision. We are in internal discussions about QuickAdmin future and I guess we will go with some kind of smallest possible SaaS version just to test it out, and then we’ll see how it goes after some feedback. I am the creator of https://github.com/InfyOmLabs/laravel-generator. This topic totally makes sense like the most of the packages are not updated for newer versions quickly and even bug fixes are not delivered fast because we are not working a full time on it as we are not making any money from it. so it will be a really good if people either donate or pay for it, so someone can work a full time on it and they can get best out of it. Even we have a plan to work on other major features which are in those 43 open issues. But yeah, of course, it will take a bit time because it’s not our full-time thing. Great to have your opinion, Mitul, and great package! Will definitely try it out and maybe even write a review. I been thinking the same since I read about spark. Literally take web development to the next level. Beside code generation, CRUD operations, built-in REST API we add a workflow builder like you have with Zapier or IFTTT to connect to other services. We also provide an excel to web app importer. In addition built web apps can be exported and imported (the idea of web app templates). I believe there is a big market and need out there. We already have more than 1000 subscribers in our pipeline who are interested to test and use it. Time will tell how many at the end are willing to pay for it. If you are interested in using our platform to export ‘code’ for your development, this would be a simple feature we would be able to add to. Would love to here your opinion. Thank you for the comment, just watched the video of saas.do in action – really impressive! Good luck with bringing it to market! 1. You’re saying you can export the code of the development – what language/framework is it on? Is it easy to install final result on my server? 2. Targeting developers vs people without coding: after watching the video, I would argue that someone non-dev would understand what is Entity, Relationship (one-to-many etc.) and some other terms. So to use saas.do, you still need to have at least some understanding of databases and such. What do you think? 3. In my case for QuickAdmin, the idea is to target developers so that they would generate the basic adminpanel, then download it and then continue to adding their own logic on top of that – like additional roles restrictions, export to whatever format they want etc. thanks for the questions and feedback. 1. Laravel 😉 . 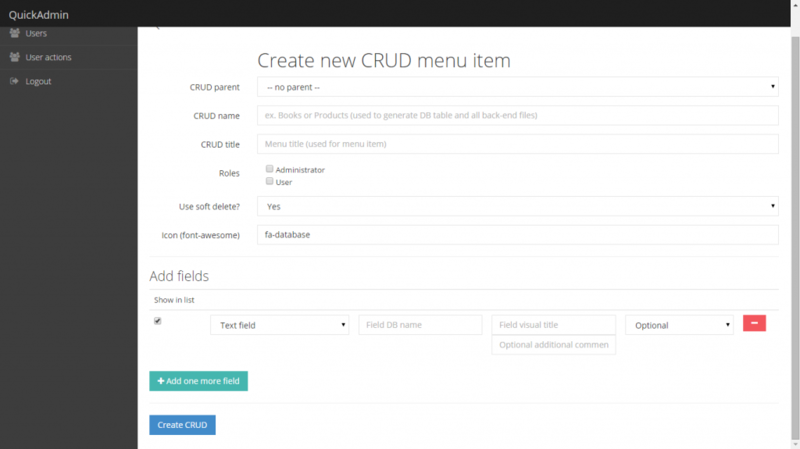 There will be similar solution to Laravel forge. Provide your server credentials and it will deploy the application / code. 2. You are right, finding an easy-to-understand wording is hard. From our personal point of you, you don’t need to understand database structure but your business and the processes. We expect that an IT Administrator, IT Consultant or a Digital Agencies to be our focus customers. We won’t be able to serve all users. Tutorials, a knowledge base should deal with this. 3. I got that idea. I think there is a good market for it, however my question would be what would the developer do, when he want to change structure and code after the export? In our case each web app has its own git repo. If a customer does not want to store the web app (each web app runs own its own database) and data on our server then they can move to there own one. See 1. ), todays devops tools and solutions are awesome and I believe we can fully automate the deployment process. Sure it is a trust issue. But then any SaaS would not be an option. I like the idea, but (yes, there’s a but, I’m so sorry) for me, design matters A LOT, so unless this is easily tweak-able, it would be a dealkiller. If you pre sold this I would certainly buy a licence. Our team looked at your admin panel when developing https://buildpivot.com but it wasn’t an easy integration with laravel spark which is what BuildPivot is built with. We subsequently built our own version using the bootstrap admin panel templates but if we could have bought a licence for $20 it would have saved us a lot of time, regardless of what it looked like. Most people just need a quick admin panel to test an MVP so it doesn’t have to be perfect. Ok, things just got interesting. QuickAdminPanel was built for, well, creating adminpanels, not full CMSs like WordPress, so it doesn’t have media manager or tagging system for posts. It’s a skeleton to create adminpanel forms and fields visually – so you specify which menu items and fields you need (for example, Posts with title, description, author etc) and it creates all the CRUD – list, create, update, delete function. And then, as soon as you’re happy, you download that as a Laravel project. And then you attach your front-end to it with Laravel code.